A bit slow getting this one together, but better late than never! Here’s a look at a few of my prized purchases of this month. Now many of you will know that Doctor Who merchandise has been firing out on all cylinders this month, with Ace, the Priory set and of course the recent Doctor /Dalek 2-packs. Not all of those will be chronicled here, but you can find the reviews of said sets both on here and on my YouTube channel. So without further ado, let’s run down the list! Okay so this isn’t a single figure, but with the Doctor Who Classic range you are hard pushed to find single carded releases. Most of my thoughts and feelings for this set are detailed in the review below, but for the purposes of this article, here are a few points on why this set is so amazing. Value for money. This was something I didn’t mention in the review, but for a set that’s £29.99 you’re getting a lot for your buck. 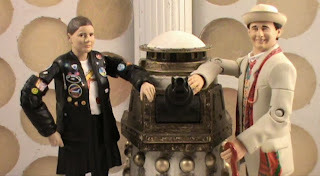 Two new figures (sort of), one of which has electronic parts. Then we have the plethora of accessories and of course that wonderful diorama. Once upon a time £24.99 would only get you the two figures. That extra fiver goes far! I have already expressed my baffled joy at the Marcus Scarman figure, and I’m sure anyone else of an age or of a particular audience will feel the same way. My brother saw him in-hand for the first time on Wednesday, and although he admitted it was a strange choice of figure he was quick to note that it is still cool to have him. Now we just need Sarah, Ibrahim Namin, Lawrence Scarman, the poacher and the butler for a full cast of figures! Sutekh’s glowing eyes are a much loved feature by collectors of any age, whether you’re a kid or whether you’re like me and my brother, ‘crazy men-children’ (Thomas, Kat: 2013). 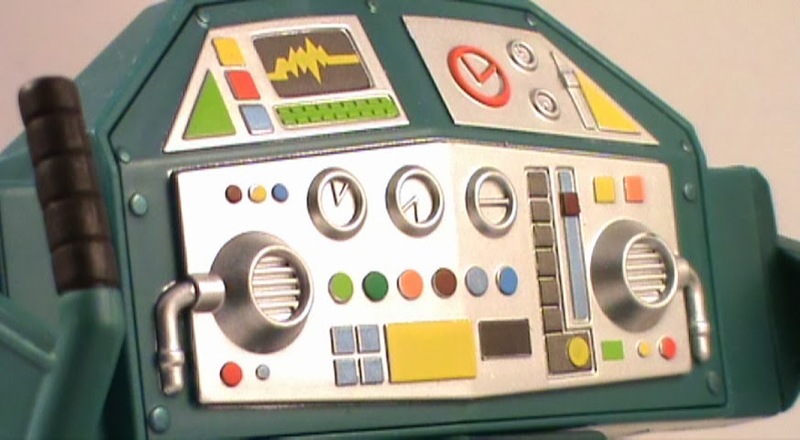 It works perfectly and the feature is concealed well in the back of Sutekh’s head. No large buttons sticking out a la Toy Biz Batman/DC Superheroes here. Then there are all the fun accessories to finish off your recreation of the story. The final set of canopic jars (which someone has informed me aren’t accurate), and that excellent Sarcophagus with the holographic Smarties flying through space. All great fun. The Osiran Service Rocket is the icing on the cake. Who cares if it’s made of cardboard? It works a treat and looks so cool on display, especially with all of the other Pyramids of Mars releases to join them. If you get one of the FPI exclusive sets this year, I’d say go for this one. Ah another Masters of the Universe Classics figure. Well, a set. As MotUC and Doctor Who Classics are the only toys I really buy these days (my sincerest apologies to DC Universe Classics and Marvel Legends) there’s likely to always be something Masters related in this monthly slot. This time it’s Sky-High and his Jet-Sled, or Sky-Sled to those of us who care little for the copyright woes Mattel have faced with this one. Sky High is based on a piece of vintage art from the original toy-line, an unnamed pilot flying the Wind Raider. 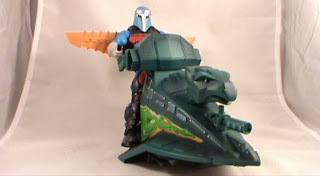 As such Mattel has released this fellow under the name Sky-High. Makes sense, no? The bio on the back gives him a bit of character, and he’s basically the Eternian equivalent to Hal Jordan. The best of the best, no rules test-pilot. 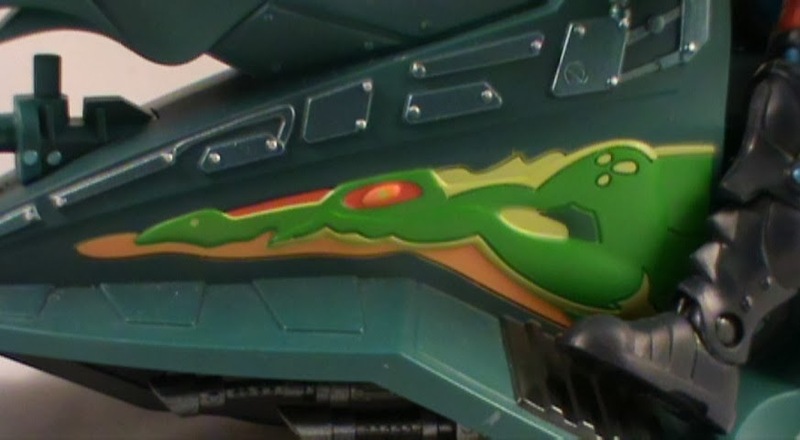 The figure is a neat design; the armour is adorned with the same dragon design as the Wind Raider in a bright metallic red, making a nice connection to his test-pilot job description. His ‘wings’ on the back, which I imagine to be some form of glider to escape exploding aircraft, also allude to the Wind Raider wings, which is also a nice touch. 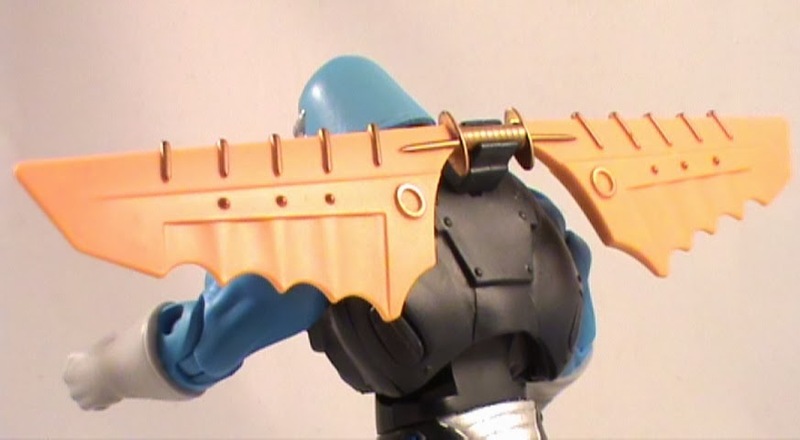 The ‘wings’ can be removed so the pilot can fit in the Wind Raider (sold separately) but also used as a double bladed weapon. Perfect for slicing down Skeletor’s minions or Horde Troopers. As with all of the figures in this line the head is removable, allowing you to put the heads of other characters in its place. Fancy having He-Man in full pilot regalia? Well now you can! 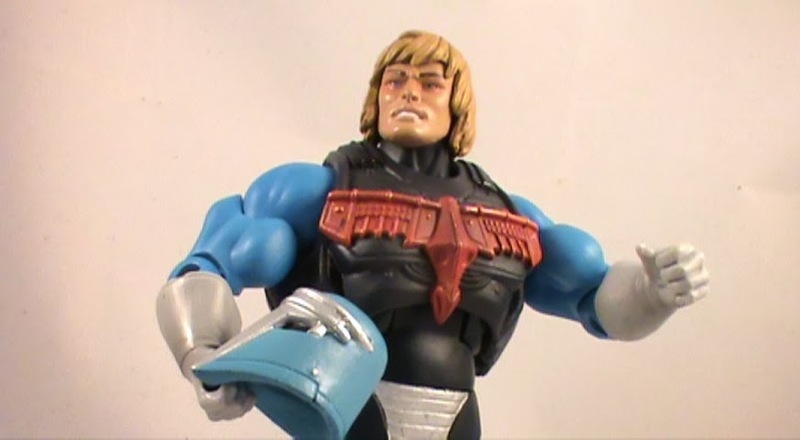 Placing the normal head under arm even makes it look as if He-Man and co. are carrying their helmets with them. A serendipitous element that works very well! 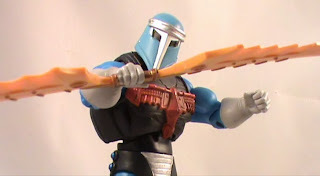 The design of the helmet, although simple, is very much a ‘knight of the realm’ design that fits in very well with the sci-fi fantasy ethos of MotU. The metallic blue paint apps help the armour details to stand out against the main black of his armour. He’s not one of the most interesting of designs in some respects, but the black makes him stand out from the rest of the Heroic Warriors, and the knight-look when stood with the Palace Guards makes you feel that the armies of Eternia are clearly regimented. I can see why those who can afford too bought a couple of these as army builders. They look cool on the battlefield. Now the main selling point for this set was the Sky-Sled. I mean Jet-Sled… yes… of course I do… Anyhoo, the Sky-Sleds have been one of the most common ways for travelling across Eternia. They were a common feature of both the Filmation and Mike Young Productions cartoons, the latter of which got me into MotU, and sadly only had a toy in the vintage line. I longed for one in the 2002 toy line I grew up with, but alas no. But that’s all academic now, as this version is brilliant! A beautifully sculpted piece from the Four Horsemen. 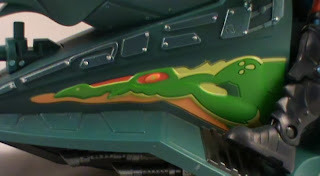 The control panel details are fully sculpted and painted, as are the dragon designs on the sides, no place for stickers here folks! The application of metallic blue paint to the nuts and bolts really make these small details stand out. The back of the Sled features two small ‘clips’. For the uninformed this is a nod to a possible Battle Ram to be released, which was teased at a Toy Fair/Con back in 2010. 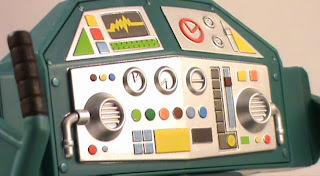 Sadly due to the lack of interest in the first vehicle of the line, the Wind Raider, all plans for this got shelved. However what we did get is the front half, the Sky-Sled, the bit I really cared about. So it’s no issue to me that we don’t have the ‘tank’ end of this larger Battle Ram, but the fact that the Sky-Sled has been constructed with the possibility of that in mind is a cool touch. Well how could she not be? The funny thing is, after the laboured wait we had for this figure I was beginning to lose interest. Honestly! But when she did arrive I was besotted! 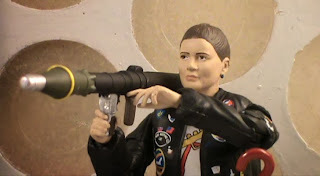 Ace is a stunning figure that captures Sophie Aldred’s likeness perfectly and features some incredible details in the form of her badges. The two display options are a fun but fiddly process, which is great for anyone who is interested in displaying her in other ways. The accessories here are amazing. She has tons! Not just her baseball bat, but a rocket launcher with removable rocket, three cans of Nitro 9, and a rucksack… that works! Underground Toys really pushed the boat out with this one and it really does show. A wonderful figure who we can at last put on the shelf alongside the professor. Thanks for reading! Join me at the end of November for some more figures of the month! I hate to say it but you missed one character off pyramids of mars: Dr. Warlock. Sorry if I'm being pedantic but I thought it was unusual for you to miss something like that out. Night of the Doctor online in 15 minutes?!? !